There are a number of companies worldwide that provide oil and gas well field services. One of the services offered provides for enhanced output from the well. The service company injects various additives to the well head. 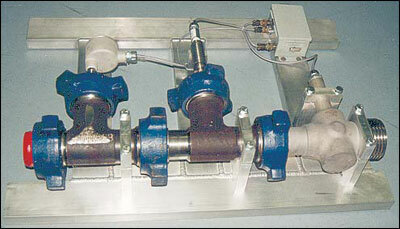 Turbine flowmeters are commonly used to meter the liquid and gas additives. 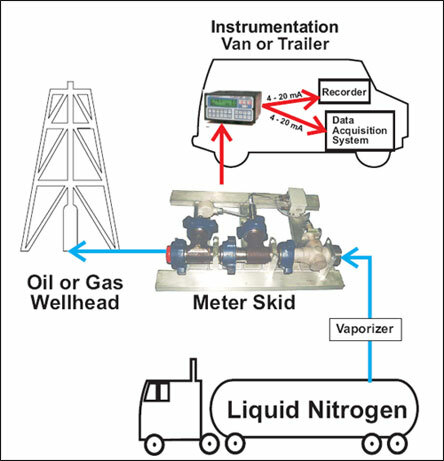 A specific application identified by Dowell Schlumberger of Sugarland, Texas is for monitoring high pressure gaseous nitrogen at pressures of 0 – 10,000 PSI. During the injection process, Dowell Schlumberger monitors a number of process variables to ultimately improve the output of the well. Accurate over pressure range 0 – 10,000 PSI. Rugged to withstand harsh field conditions of oil fields. Lightweight for transportation between sites. Totalize output of nitrogen gas in mass units. Provide compensated analog output for data acquisition system. –Wingnut turbine flowmeter designed for pressures up to 15,000 PSI. -Wingnut housings to accommodate installation of high pressure temperature and pressure transducers. -Aluminum frame supports meter run and is used to carry the meter run. -A manifold collector box that accepts independent signal inputs from flowmeters, temperature transmitter, pressure transducer. Collector box provides for one cable assembly that carries all process signals to the remote mass flow computer. 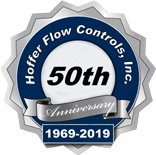 The flow system allows the customer to accurately monitor mass flow during the well treatment. Based on the information obtained from the system they can adjust the treatment of the well head to provide for optimum product output.